The foothills of the Ochoco Mountains rise to the west of the grasslands near the Painted Hills, Oregon. It has been way too long since I’ve done a travel-oriented post. It’s really my favorite kind! So in place of photography advice this week, I’m going to recommend a photo destination: The Painted Hills! They are known by landscape photographers across the west, and even across the country and world. Perhaps you have seen pictures of them. Lying in a remote area of central Oregon near the small town of Mitchell, the Painted Hills are a series of colorful formations with photogenic textures. This post will give some tips on visiting and photographing them, and also some background information on the area’s fascinating geology. It is the first of two. The Painted Hills are part of John Day Fossil Beds National Monument. National Monuments, if you don’t know, are sort of like National Parks lite; they’re protected federal land that is not as high profile as parks. This national monument is made up of three main areas (units) separated by drives of 2-3 hours. It is a very scenic area worth exploring outside of the Painted Hills themselves. The three units – Painted Hills, Sheep Rock and Clarno Units – form a rough triangle that can be explored going either clockwise or counter-clockwise. You’ll need a car, no 4×4 is necessary. There is easily obtained camping and lodging scattered through the area. It is definitely not touristy. Morning light hits the Painted Hills in Oregon. Home on the range in central Oregon near the Painted Hills. If you want to hit the Painted Hills first, drive east from Portland on Hwy. 26. Follow it across Mount Hood and through an Indian reservation. Then, just after passing through the town of Madras, turn left to stay on Hwy. 26. 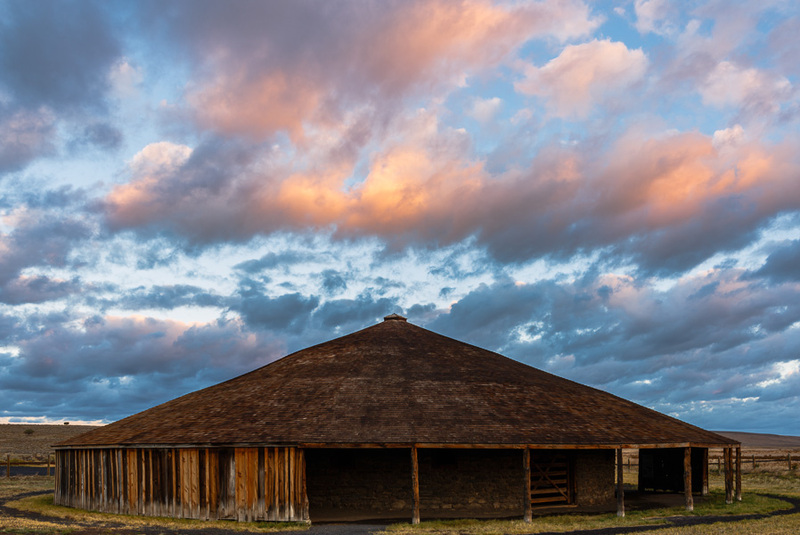 It will take you through the cow-town of Prineville, up and over the beautiful Ochoco Mountains, and down into the huge basin where the Hills sit. If you’re coming from Bend, first drive north to Redmond, then east to Prineville to pick up Hwy. 26. The signed turnoff for the Painted Hills, Bridge Creek Road, is not far after you finish descending off the Ochocos. The Hills are about 6 miles north of Hwy. 26 just off Bridge Creek Road. In the Painted Hills, a family of geese makes its way across a rare stretch of water in this dry area of eastern Oregon. Fossil soils form colorful bands in Oregon’s Painted Hills. What are the Painted Hills? The Painted Hills are formed by exposures of sedimentary rock belonging to the Big Basin Member of the John Day Formation. In the Oligocene epoch, some 34 million years ago, volcanoes to the west sent ash clouds over the area, and streams deposited more layers of ash-rich sediment in a subtropical river basin. The sediment weathered to deep soil before being buried and turned into rock. Because they are rich in volcanic ash (tuff), the rocks weathered to a clay-rich material. Volcanic ash has a lot of silica and aluminum; just add water and you have clay. You will not think of rocks when you first see the Painted Hills. They look like they’re made of soft fluffy sand or dirt. But if you could take a shovel and dig down into this stuff, you’d soon hit solid rock. It is merely rock that has been heavily weathered, not just under today’s climate but under the ancient wet climate it was originally deposited in. Don’t go digging though, take my word for it! The frequent wet-dry cycles of today’s semi-arid central Oregon cause these clay-rich “fossil soils” to crack in a fascinating pattern called alligator cracking. It can easily take years for the clays to crack in this way, so if you walk on them you are ruining the scene for countless photographers and other visitors who come behind you. Please heed the signs to stay off the bare earth. The different minerals within the original rock – iron, magnesium, etc. – stain this clay with a variety of rich colors. Iron mostly weathers to red & orange but in oxygen-poor environments can weather to green. The dark bands are mostly horizons of organic-rich lignite that trace ancient oxygen-poor stream bottoms. Manganese-rich clay can form this ash-black color too. The most obvious colors, the red-orange horizons, mark the ancient soil horizons that were deeply weathered to laterite. Iron oxide (rust) is responsible for the color. It’s the kind of thing happening in deep soils of tropical regions in the world of today. The countryside around Mitchell, Oregon. As you head into the area on Bridge Creek Road, you’ll pass some teaser exposures of painted hills. Turn left at the sign and drive a short distance to a parking area on the left. You have arrived at the most popular viewpoint in the Painted Hills. They are to your east, so in late afternoon the hills can yield great photos in wonderfully warm frontlight, with the dark bulk of Sutton Mountain behind. The sun sets behind the Ochoco Mountains here, so arrive early for sunset. From the viewpoint, look up and to the left. A dark band tops nearby Carroll Rim. This rock band is a “welded tuff”, the Picture Gorge Ignimbrite. About 30 million years ago a scalding hot wave of dense ash flowed across the landscape, killing all in its path. You can hike a short trail up to Carrol Rim for a higher vantage point. From the viewpoint, walk further up the ridge from the parking lot to get good views down into the colored layers. Use a long focal length lens to get abstract images of the colored patterns. Please stay off the exposed (cracked) earth. Drive a little further in from the overlook to a T-intersection. Go left for two short nature hikes (Leaf Hill & Red Hill). If you keep going on this gravel road, just after you exit the Monument, you’ll come to a small area on the right where you can free-camp. Just be quiet and respectful; leave it cleaner than you found it. Back at the T intersection, turn right to go to Painted Cove, another short nature trail. This place is great for close-up views (and pictures) of alligator cracking. You also have a view of the only water in the area, a reservoir that is full and ringed with pretty yellow flowers in springtime. Back out towards the main entrance there is a picnic area with wonderful green grass. If you head left out at the turn off Bridge Creek Road, you’ll traverse south on a gravel road for about 6 miles to the John Day River. This is one of the river’s largest rapids, and you can camp here. Along this road there are a few spots where you can just park and head off on a hike into the hills. Get a map and make sure you are not on private land. There is plenty of public land here. In May keep an eye peeled for the wonderful mariposa lily. Deer don’t heed the signs not to walk on the Painted Hills. If you keep going east on Hwy. 26 past the turnoff to the Painted Hills you will quickly come to Mitchell, where lodging and camping (in the city park) is available. Mitchell is a tiny town, but has a restaurant and bar, along with a great bed and breakfast. Even if you don’t stay, stop for breakfast or have a beer. Meet the locals! On the west side of Mitchell, just behind and below the state highway maintenance station, is an old homestead. Once a dairy farm, this is a fantastic and little known place to photograph. Be very respectful and low-profile; don’t climb on fences or try to drive down there. Park near the highway and walk down. The buildings and barns are in good condition. In late afternoon or early morning light they offer very good image potential, very different from the landscape shots you just got of the Painted Hills. So that’s the Painted Hills. Great pictures abound. If it has recently rained the colors are that much richer. You will also find the remains of Oregon’s geologic and human histories. It’s very quiet and peaceful, a great getaway. Stay tuned for the next installment, which visits the other two units of John Day Fossil Beds National Monument. Thanks for reading! The Painted Hills in central Oregon take on subtle hues as dusk arrives. This is Oregon’s favorite place for rock climbing. The routes are rated up to 5.14, which is extremely difficult and for experts only. But there are plenty of climbs suitable for novices as well. A series of trails wind through the park, allowing hikers to watch these spider-men and women practice their sport. The Crooked River zig-zags its way around the hard formations of volcanic tuff, a dense flow of ash dumped here by an ancient volcano. Sometimes tuff can be fairly soft and friable, but this one is very strongly cemented. I woke very early, and worried that the cloudy weather would prevent a good sunrise. Rain moved in after sunrise, but at dawn the skies cleared enough for very pretty light to make its way into the canyon. The cascading song of a canyon wren echoed its way up to me from the canyon as I captured this shot. It was very quiet and beautiful, and the recent rains gave the sage and other desert vegetation a lovely scent. Thanks for looking. I hope your weekend is going well! Dawn breaks at Smith Rock State Park in central Oregon.